Ten years after arriving at Saturn, NASA's Cassini spacecraft is still able to send us delightful surprises from a billion miles away. Most recently, it cruised by the large moon Titan and caught a flash of sunlight reflecting off the liquid surface of one of the moon's hydrocarbon seas, Kraken Mare. 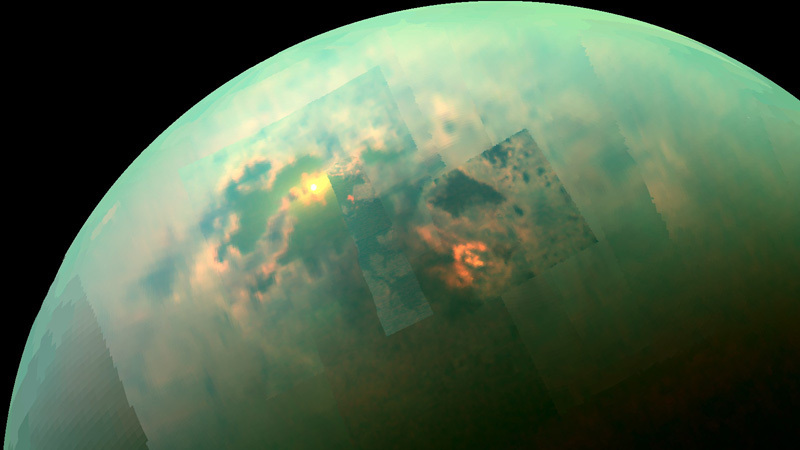 Kraken Mare is the largest sea on Titan, part of a complex of seas in Titan's North Polar Region. The bright reflection, seen in the upper left side of the image, comes from the southern region of Kraken Mare, just north of an island archipelago that separates two sections of the sea. In the past, Cassini has captured separate images of the polar seas and of sunlight glinting off them, but the picture from the August flyby is the first to show us both at the same time. On this occasion, the sun brought more to light than just the liquid surface of Kraken Mare. The southern rim of the sea was shown to have a "bathtub ring"—a coastal outline of bright material likely left behind by evaporating liquid and a declining sea level, indicating that Kraken Mare was once deeper. Similar evaporative deposits are left behind by receding lakes on Earth, such as in the case of desert salt pans. Another indicator of Titan's lively atmosphere can be found in the snapshot. The bright, arrow-like shape to the right is a cloud formation of liquid methane droplets. Methane may even be precipitating from these clouds onto the sea it stretches over in the picture, Ligeia Mare—something has to be filling those basins. Over the past decade, Cassini has made the rounds to a number Saturn's moons, the planet's intricate ring system and the dynamic wind-sculpted cloud tops of Saturn itself, but Titan has been a crown jewel of the entire mission. Probably more than any other extraterrestrial body in the solar system, Titan bears a resemblance to our own world, though a small, cold and perhaps primordial version of it. Like Earth, Titan has a thick atmosphere composed mostly of nitrogen. Like Earth, Titan's atmosphere is inundated by smog—that is, a naturally occurring haze of hydrocarbons, such as methane and ethane. Like Earth, Titan appears to have a liquid cycle, with cloud formations, precipitation, runoff and pooling. In the pictures and maps Cassini has sent us, we see coastline-like patterns lining dark flat spaces, river-like drainage networks winding and branching through mountainous terrain and plains of rippling, wind-blown dunes. 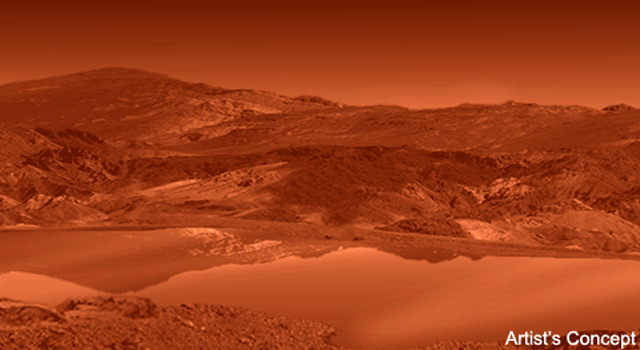 Unlike Earth, Titan is extremely cold (-179.5 degrees C), and its rain, rivers and waves lapping at the shores of its seas are not water, but liquid methane and ethane. Imagine the view if you could stand on Titan: so familiar in some ways, so very alien in others. I, for one, can't wait for the next landing mission!